Tbilisi's buses are blue and yellow and each displays a route number on the front. Many bus stops have an automated board showing which service is due next and how long until it arrives. Pay when you board (put the right amount of coins in the machine) or touch the machine with your plastic, pre-loaded Metromani travel card. Each journey anywhere in the city costs 50 tetri. You can load your Metromani card at any metro station, or use the Express Pay machines at the bus stops. 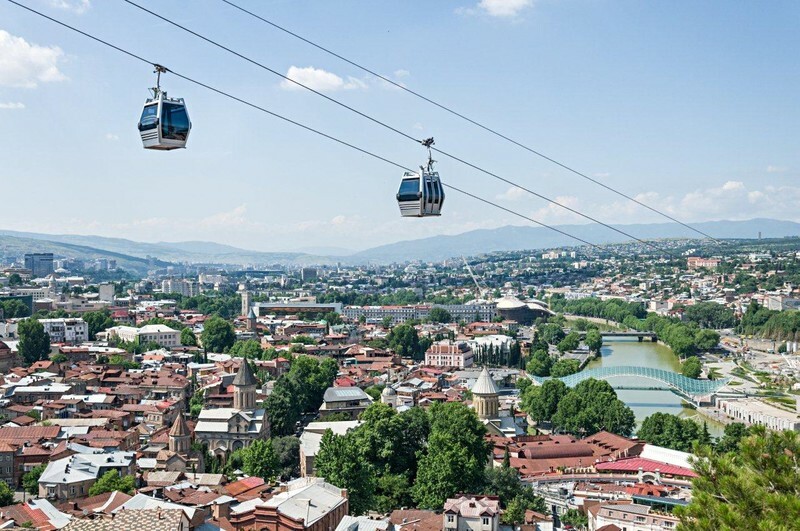 There is a cable car from the Rike Park to Narikala Fortress offering spectacular views of the city: one of the cars even has a glass floor. It costs just 1 Lari and you can use your Metromani card. The funicular railway that runs up to Mtatsminda Mountain was opened in 1905 and was recently renovated. It costs 2 Lari: Metromani cards are not accepted. 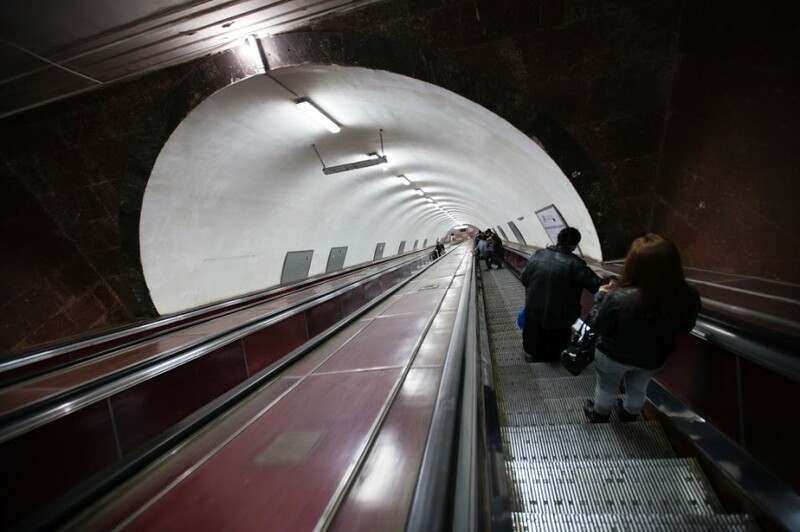 There are two metro lines in Tbilisi, which intersect at Station Square. You will need to buy a Metromani travel card to use the metro: these can be bought and re-charged at each station. A metro trip costs 50 tetri regardless of distance. Station names are written in English as well as Georgian, and in-train station announcements are also bilingual. The metro runs from 07:00 until midnight. Called marshrutkas, Tbilisi's fleet of minibuses supplement public transport and are a key player in keeping the city moving. For the uninitiated, they do need a little explaining, however. All minibuses in the city centre are yellow. Find out the number of the one you want to take and then flag one down - anywhere, there are no stops - by holding out your hand, palm facing down. Rustaveli Avenue is an exception though, they won't stop unless you're at the bus stop. Each journey is 80 tetri. You can pay with cash (have the right change) or a pre-loaded Metromani card when you exit. There are also marshrutka stations around the city facilitating travel around Georgia. The destination is displayed on a board in the window, but it will only be written in Georgian. Just ask if you are unsure which one is heading your way. In general, Didube station services the west and north of Georgia, Samgori the east, Ortachala is for international routes to Turkey, Azerbaijan and Armenia. Agree on a price before you leave - check with the locals. Taxis are a cheap and are an easy way to get around the city. 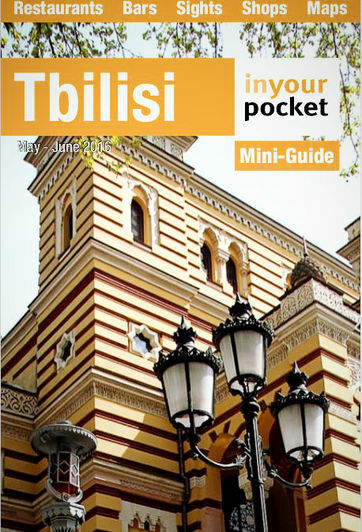 Most trips within Tbilisi will cost between three and six Lari. Some taxis are equipped with metres and fixed rates, but not all of them. Always agree a price before you set off. Haggle if you have to: drivers will almost always quote a higher price if you are a foreigner. The most efficient way to buy train ticket is to go to the Central Train Station. There is usually an English speaking staff member at one of the ticket office windows. You should have valid ID or a passport with you. You can also buy tickets online. Go to railway.ge website, click the map on the right. You can check the connections as well as buy ticket. You need to register and then follow their procedure, pretty much the same as any other online booking system. It only accepts Visa or MasterCard. If you are travelling on an electronic ticket, show the conductor the ticket purchase code and the ID you used during the booking process. Beware: the online booking engine has a habit of not working. Remember that for popular destinations (Batumi, Kutaisi, Zugdidi) you should buy tickets at least two days in advance, especially in high season.